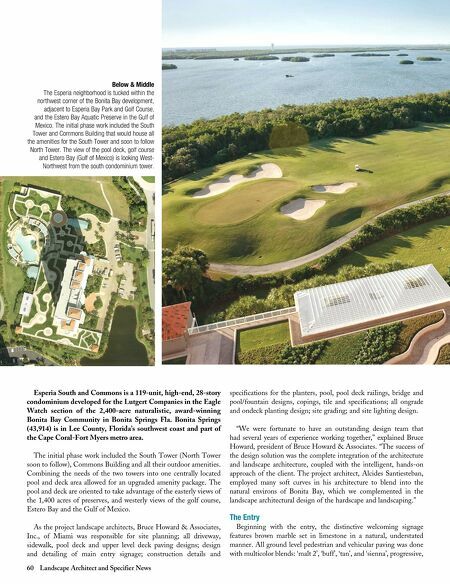 60 Landscape Architect and Specifier News Esperia South and Commons is a 119-unit, high-end, 28-story condominium developed for the Lutgert Companies in the Eagle Watch section of the 2,400-acre naturalistic, award-winning Bonita Bay Community in Bonita Springs Fla. Bonita Springs (43,914) is in Lee County, Florida's southwest coast and part of the Cape Coral-Fort Myers metro area. The initial phase work included the South Tower (North Tower soon to follow), Commons Building and all their outdoor amenities. Combining the needs of the two towers into one centrally located pool and deck area allowed for an upgraded amenity package. The pool and deck are oriented to take advantage of the easterly views of the 1,400 acres of preserves, and westerly views of the golf course, Estero Bay and the Gulf of Mexico. As the project landscape architects, Bruce Howard & Associates, Inc., of Miami was responsible for site planning; all driveway, sidewalk, pool deck and upper level deck paving designs; design and detailing of main entry signage; construction details and specifications for the planters, pool, pool deck railings, bridge and pool/fountain designs, copings, tile and specifications; all ongrade and ondeck planting design; site grading; and site lighting design. "We were fortunate to have an outstanding design team that had several years of experience working together," explained Bruce Howard, president of Bruce Howard & Associates. "The success of the design solution was the complete integration of the architecture and landscape architecture, coupled with the intelligent, hands-on approach of the client. 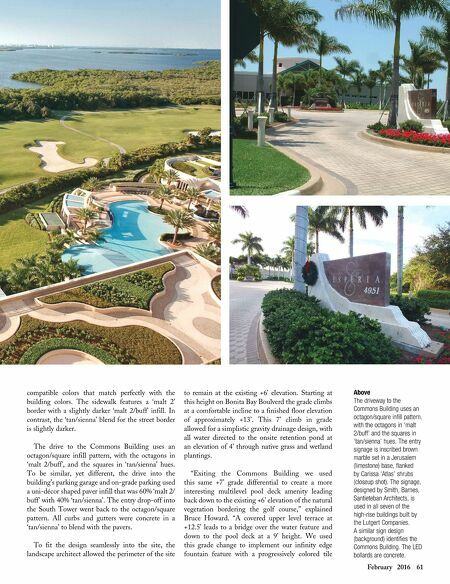 The project architect, Alcides Santiesteban, employed many soft curves in his architecture to blend into the natural environs of Bonita Bay, which we complemented in the landscape architectural design of the hardscape and landscaping." The Entry Beginning with the entry, the distinctive welcoming signage features brown marble set in limestone in a natural, understated manner. All ground level pedestrian and vehicular paving was done with multicolor blends: 'malt 2', 'buff', 'tan', and 'sienna', progressive, Below & Middle The Esperia neighborhood is tucked within the northwest corner of the Bonita Bay development, adjacent to Esperia Bay Park and Golf Course, and the Estero Bay Aquatic Preserve in the Gulf of Mexico. The initial phase work included the South Tower and Commons Building that would house all the amenities for the South Tower and soon to follow North Tower. The view of the pool deck, golf course and Estero Bay (Gulf of Mexico) is looking West- Northwest from the south condominium tower.